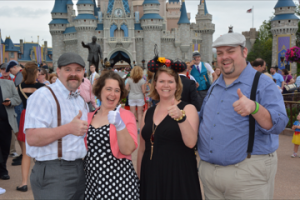 This piece is a follow up to an introductory article about Spring Dapper Day at the Magic Kingdom. 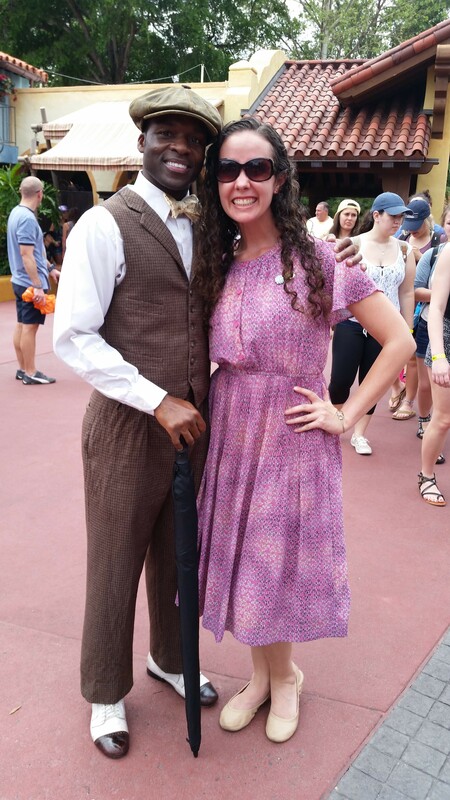 To read it first please visit the following link: Spring Dapper Day at Walt Disney World. 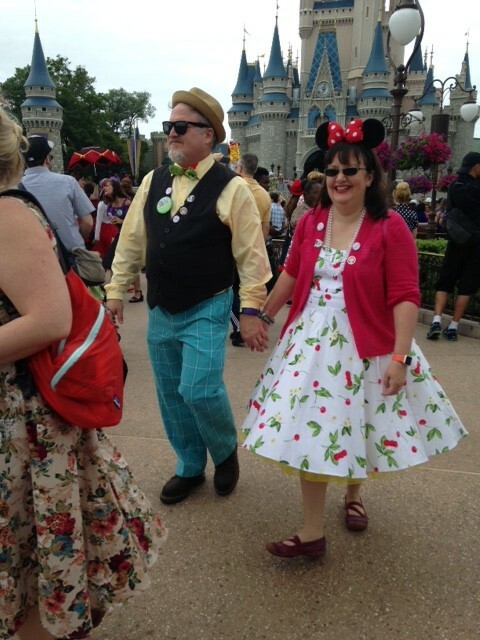 I am happy to report that we have returned from our short trip “home”, are now well rested, and I am ready to tell you all about the dashing good time we had at Dapper Day. It was so fun to see everyone else in their dapper attire. Men, women, children: people of all ages partook in the fun. I was very surprised at how many people were dressed up. It seemed like almost everyone! I felt sorry for those poor souls who were merely wearing their normal vacation clothes. We did have a few stop us and ask why everyone was so well dressed; and some of them said they wished they had know so they could have done it as well. 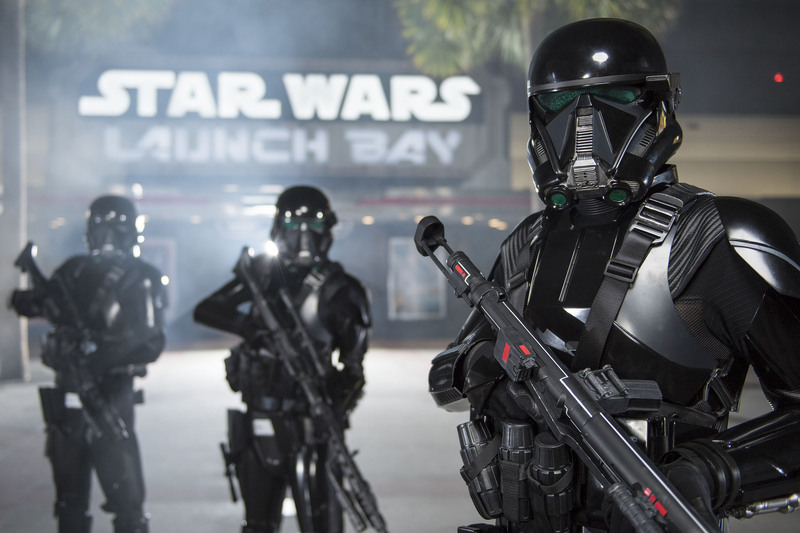 In my last article I had left you all hanging as to what we were going to wear. It really was a hard decision. We debated styles from the 1920’s, the 1950’s, and even theming our outfits based on Disney characters. My husband’s attire was easier to plan and it sort of just fell into place. For our anniversary earlier last year I had bought him a Mickey Mouse bowtie (with no clue as to when he would ever wear it), and around Christmas time he began growing out his normally very short cut facial hair. 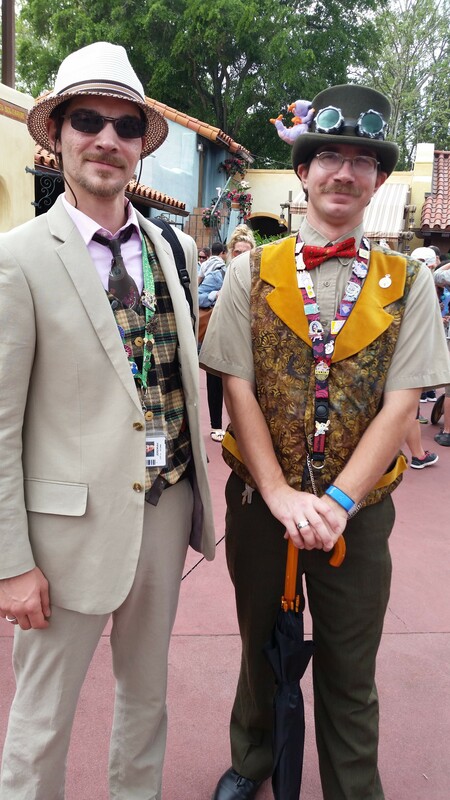 I had fallen in love with the handlebar moustache look and had convinced him that he needed to have one for Dapper Day. He lovingly obliged. Also around Christmas last year, while shopping in Target, I had made him try on a hat which I was convinced he would be super cute in. He was. I bought it. He had first thought he wanted to look like a dapper Walt Disney with knickers and a dress shirt that we had scene in a photograph. That changed when we had a very hard time locating a vintage styled pair of knickers that were in our “wear it once” budget. Instead he found a very nice pair of dress pants at a local thrift store that went with the shirt he wanted to wear. The last part of the outfit was leather suspenders. That was the third piece to his outfit that I insisted on. I am really lucky that his taste in clothing is pretty much in sync with mine. With his outfit done we moved on to mine. I won’t bore you with all the details and indecisiveness of my planning. But during the course of it all I had four different dresses, two different pairs of shoes, and I now own a bunch of makeup that will never get used. I just couldn’t pick. It really came down to the fact that I only took two with me, which could share the same accessories: white gloves, coral shrug and white shoes. One was white and lacey, the other black with white polka dots. The weather determined for me the morning of the event. It was supposed to be overcast all day with a chance of rain. 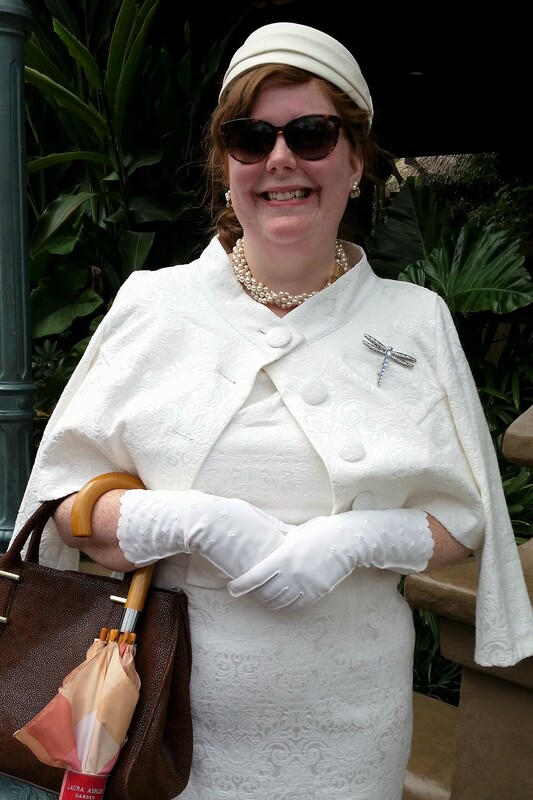 I did not want to be walking around Magic Kingdom in a wet white dress. Black it was. I think the outfits came together really well in the end. And even if they wouldn’t have, we would have had fun either way. We shared the day with our friends who dressed up too. It made it easier not to feel self conscious about dressing abnormally for a day in Magic Kingdom. 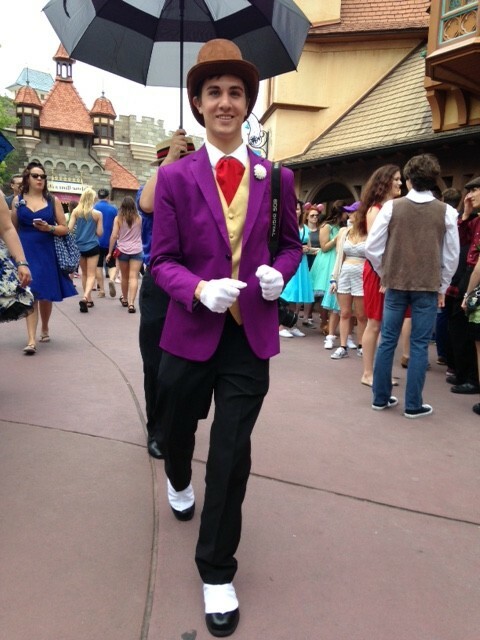 We even got to stroll down Main Street after the Move It Shake It parade with all the other guests who were Dapperly dressed. I can honestly say it was one of the best days we have spent in the park and we are trying to figure out how to get back in November for the Fall Soiree at Epcot. 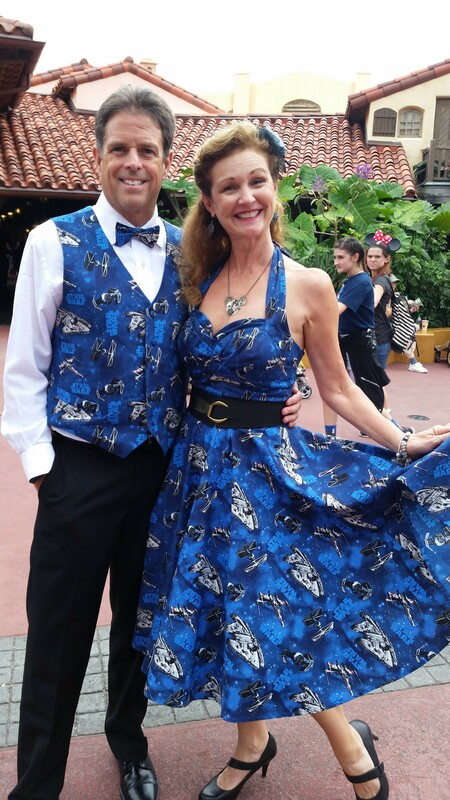 That is the next Dapper Day event scheduled in Walt Disney World. It is Saturday November 12th. Imagine strolling around World Showcase through the Food and Wine Festival in your dapper attire! I am dreaming of sitting in France eating a macaroon with all the other beautifully dressed ladies and gentlemen. As with the Spring Dapper Day we just attended, they are offering group discounts on resort stays (POP, Beach Club, and Port Orleans French Quarter only) and park tickets. 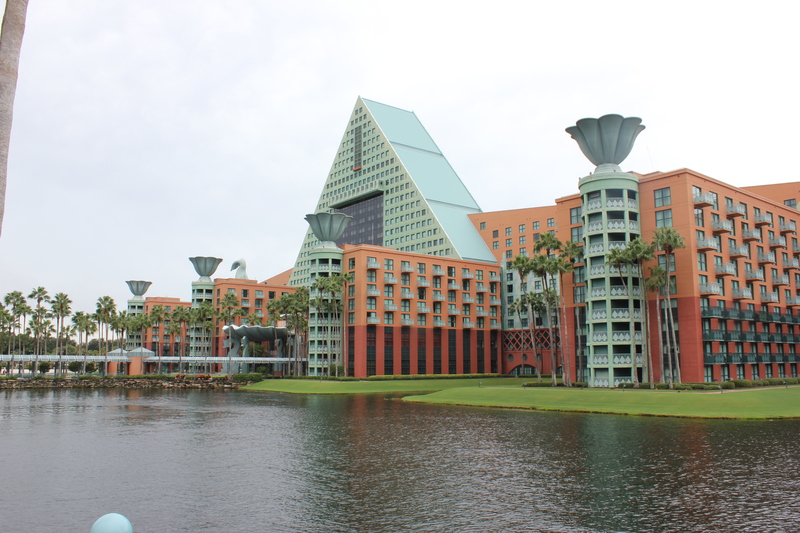 You need to call the Disney group reservation phone number (407-939-4686) to inquire about pricing. 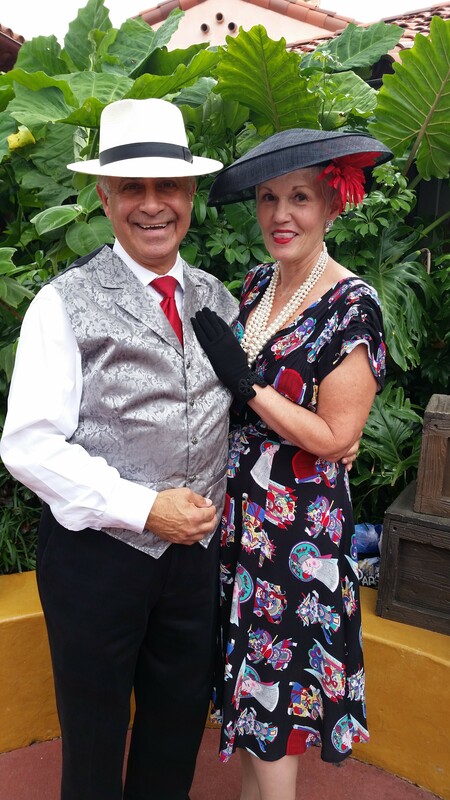 Use Group name: “Dapper Day Fall Soiree 2016” and Group Code: G0700289. See their webpage for more details. Now, the visuals. 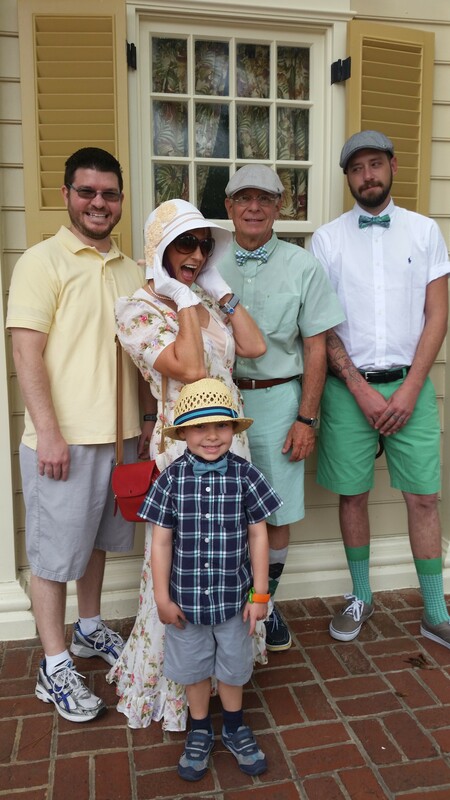 Some of the super cute and amazingly Dapper folks we encountered at Dapper Day in Magic Kingdom. Hope you enjoyed and hope to see you in November!! Reasons: 1) knickers = ladies underpants 2) pants = mens underpants 3) suspenders = holds ladies stockings up, usually made of lace.